Ladd's Addition, located in the Hosford-Abernethy neighborhood, is one of the oldest - and most desirable - residential districts in Portland. Known for its gorgeous, arching trees and unconventional diagonal street pattern, there is a lack of car traffic that appeals to families and those looking for a quieter lifestyle. Ladd's Addition provides a safe place for kids to play, convenient biking steets, and wonderful community, all while allowing you to remain close-in to Portland’s attractions. Driving downtown takes less than 10 minutes; it’s a short walk down to the restaurants on Division and a short trip up to the boutiques and bookstores of Hawthorne. Our favorite features of Ladd’s Addition are the gorgeous natural features, including the mature American Elm trees that line the narrow streets (protected by the Ladd's Save Our Elms organization), four diamond-shaped test rose gardens, and beautiful circular park in the middle of Ladd's circle, perfect for a summer picnic with the kids or a romantic moment with your special someone. Ladd's Addition homes are some of the most beautiful and historic in town, with many craftsman, Victorian, and Old Portland homes with beautiful lawns and original details. In 1891, early Portland mayor and banker William S. Ladd decided to subdivide his 126-acre farm for residential use and dedicated to the public an innovative Victorian plan for a "Residence Park." This plan was inspired by Pierre L’Enfant’s plan for Washington, D.C., including a diagonal "wagon wheel" arrangement, four small rose gardens, and a central traffic circle surrounding a park. This was at a time when Portland’s park system was in its infancy, and the community plan has kept Ladd’s Addition livable for over a century. In the 1980s the Ladd’s Circle park was renovated and volunteers planted over 400 trees from 1986-90 at a time when 40% of the original street trees had been lost. The entire Ladd’s Addition neighborhood was designated a historic district by the National Register of Historic Places in 1988. Ladd's Addition is located in inner southeast Portland and is bordered by SE Hawthorne, SE 12th, SE Division, and SE 20th Streets. The neighborhood can be difficult to navigate, due to the diagonal streets and roundabouts, but once you get a hang of the shift out of the Portland gridded street system, you'll appreciate the safety and serenity afforded by the layout. Ladd’s Addition is full of gorgeous historic homes, many of which were built between 1905 and 1920. Many of the homes have been painstakingly renovated to bring them into the 21st Century while preserving their charming historic character. You'll find craftsman bungalows, English Cottages, Old Portland Four-squares, Victorians, and classic ranches. You'll even see old churches that have been turned into homes! In 1909, Park Superintendent Emanuel Mische designed a formal landscape plan for the gardens in Ladd's Addition. He planted camellias, perennials, and a lawn area in the central circle and numerous rose varieties in the four diamonds, creating a stunning stained glass effect. Today the gardens feature over 3,000 roses of sixty varieties that were popular in the early 20th century. This organization assists the city to maintain the parks since the district now hosts over 250 of its original American Elms and about 200 new disease-resistant elms. FLAG believes in keeping Ladd’s safe, healthy, and connected with good neighborhood relations. They host annual events for the entire community, like the Annual Neighborhood Picnic in July, or the Annual Holiday Party and Silent Auction. FLAG is always looking for community volunteers to help host events and help maintain the gardens and surrounding areas. Family established and owned since 1980, Longfellow’s Books is a friendly and accommodating bookstore specializing in old-style social sciences and liberal arts, used, rare and antiquarian books. The owner and manager Jon has lived in Portland for over 50 years, and his family has lived in Ladd’s Addition for 30 so he and his bookstore have become an integral staple in the community. A person could spend hours browsing their large sections on Oregon, Literary First Editions, the Classics, or rare magazines (among other curiosities) but their hours are short; they only open for the afternoons, Monday through Saturday. Help maintain the roses in one of the four rose gardens by adopting a rose bed, complete with instructions and snazzy designation medallion. Adopters select an available bed, and then maintain it throughout the summer by weeding and pruning. It’s a great way to get to know neighbor adopters and feel good about doing your part for the community. Considering there are over 3000 rose bushes in Ladd’s Addition, one Portland Parks Bureau gardener and small crew can’t do it all. That’s why every summer from June through September Ladd’s Addition residents participate in Saturday morning, and sometimes Wednesday evening, deadheading sessions to maintain the rose gardens and keep them looking their best. Everything is provided—garden tools, and pruning instructions—and the best part is that you can join your neighbors for whatever your schedule allows, whether it’s 20 minutes or an hour. Cartopia Food Carts on Hawthorne and 12th - Portland is well known for its dining culture, and although our upscale restaurants are noteworthy, some of our real culinary gems are on wheels. Portland’s food cart scene has gotten a lot of attention from the New York Times, Bon Appetite, and Sunset Magazine, so you’ve probably heard rumors of the rebellious chefs leaving the restaurant world and taking on a micro-eatery in an old bus, truck, trailer, or train car. The carts in Southeast are popular with the late-night crowd looking for a snack after a movie or local music show. The Cartopia Pod on SE Hawthorne and 12th is especially popular for its late night hours, comfortable seating, and an incredible variety of cuisines suited to every culinary preference. Johnny B’s - 1212 Southeast Hawthorne Boulevard - This family owned breakfast joint is straight from the 50s, from the tile floors to the little breakfast bar. You know, like the ones with a short order cook in the back kitchen wearing all white, and the waitress is chipper and happy. With it’s charm, lots of regulars visit for the perfectly golden and crispy hashbrowns, cinnamon batter pancakes, omelettes, and delicious biscuits and gravy. This place isn’t for the one trying to watch their calories, this is a straight up American-style breakfast café. They close at 2 p.m., have reasonable prices, and sit right on Hawthorne at the edge of Ladd’s Addition. Some say the best part is people watching, so get a newspaper or laptop and "pretend" to look busy while you’re waiting to break your fast. Who knows, you might become the regular soon too. 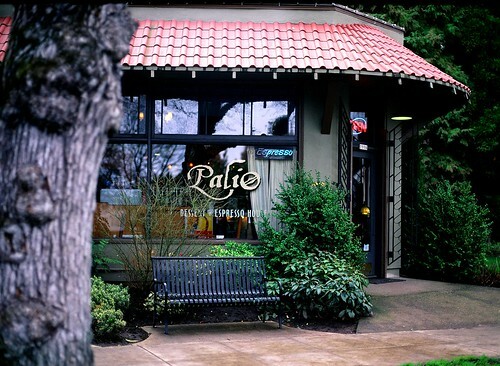 Palio Espresso and Dessert House - 1996 Southeast Ladd Avenue - Palio is smack-dab right in the middle of Ladd’s Addition, and it’s the perfect place if you’re looking for a hideaway spot, need to write a late term paper, or want to hang with friends over a game of Scrabble and perfectly prepared Stumptown coffee. They also offer a variety of pastries and desserts, big bowls of soup perfect for a rainy day, and delicious Key Lime Pie in the summer. Some of the fun features: they are wonderfully vegan friendly, have a distinctive and special blend for their Mexican Mocha, and supply chess boards, Scrabble, Trivial Pursuit cards and wi-fi, and importantly, sitting for any size group. Artemis Café - 1235 Southeast Division Street - Professional, friendly and efficient staff help to create a nice atmosphere for morning coffee or a business lunch. A popular wi-fi hangout, Artemis Cafe does wonders with their Stumptown medium and never ceases to procure amazing, innovative and, most importantly, delicious food. They have an in-house pastry chef, creative sandwiches like the grilled rosemary chicken with sun-dried tomato pesto and provolone, homemade soup, and daily specials. Most of their fresh food is organic and locally supplied, but if that's not enough, they practice sustainability and environmental responsibility, and welcome your own mug.